The Ani are one of five ethnic groups in Kaiyuan County who have been grouped together and labeled the Aza by the Chinese. One publication, the Kaiyuan Xian Zhi (Annals of Kaiyuan County) states, "Based on linguistic and cultural differences, the Aza can be divided into five groups." Despite their claims of self-identity, the Ani and the other four groups called Aza have been included under the official Yi nationality by the Chinese authorities. Today the Ani are being rapidly assimilated to the Han Chinese culture and language, but in the past the forefathers of today's Yi groups had many unique customs that shocked visitors. When Marco Polo passed through Yi areas in the thirteenth century, he recorded, "When [the people] fall in with any stranger in want of a lodging they are all eager to take him in. And as soon as he has taken up his quarters the master of the house goes forth, telling him to consider everything at his disposal, and after saying so he proceeds to his vineyards or his fields, and comes back no more until the stranger has departed. The latter abides in the caitiff's house, be it three days or be it four, enjoying himself with the fellow's wife or daughter or sister, or whatsoever woman of the family it best likes him; and as long as he abides there he leaves his hat or some other token hanging at the door, to let the master of the house know that he is still there. As long as the wretched fellow sees that token, he must not go in. And such is the custom over all that province." Today there are few customs remaining among the Ani that could be considered traditional. However, until about 50 years ago an Ani son made wooden figures of his dead father and mother which were kept in the roof hatch until the son's death. They were then taken out and burned by the grandson. Although they mostly ignore him, the Ani believe in a Creator. Today, most practice simple ancestor worship and believe in spirits that can cause disease if ceremonies are not held to placate them. Catholic and Protestant mission work in Kaiyuan County prior to 1949 failed to impact the Ani people. Although Catholic work began in the late 1800s, the first Protestant missionary in Kaiyuan was an American who came in 1914. He established three "Gospel halls." 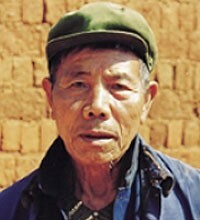 Five years after he came, he had won only eight people to Christ, but by 1934 there were 60 Han Chinese believers. View Ani in all countries. 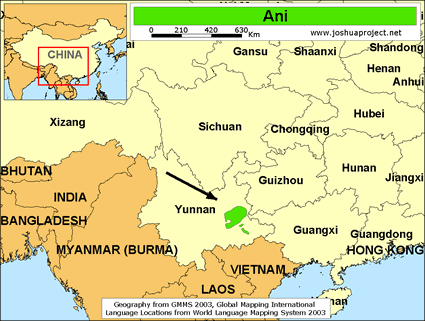 Location in Country: Approximately 3,000 people belonging to the Ani tribe live in one small area of southwest China. All Ani live within the Zongshe, Masangqing, Qibudi, and other surrounding villages in the Yanggai District of Kaiyuan County in Yunnan Province's Honghe Prefecture.